This entry was posted in Sound mirrors and tagged Denge, open day, RSPB. Bookmark the permalink. 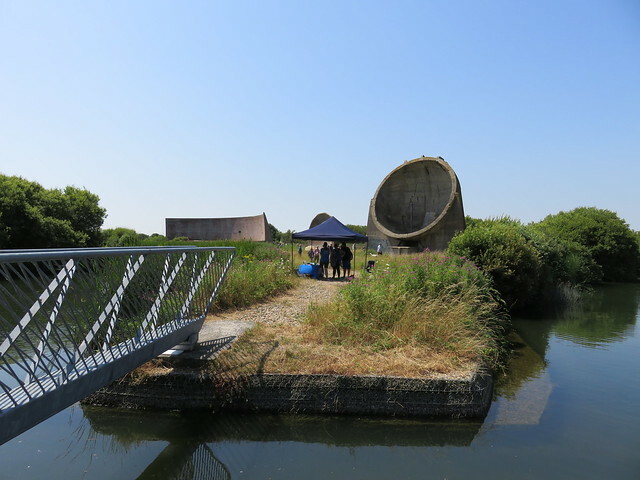 I’ve known about the Sound Mirrors at Denge for some time and finally visited them today. Obviously, I could only get as close the as the closed bridge, but that was close enough to be completely bowled over by their presence. They’ve a real aura and intriguing eeriness about them. Simply fascinating! I’m a musician and music teacher with a degree in Music Production and Sound Engineering, and so have both a personal and professional fascination with things of this nature. My first thought when walking back to the car was if anyone has ever made any audio projects with these mirrors. By audio project, I mean something along the lines of actually recording the audio from the parabola of the dishes and/or curved wall? I imagine you’d be able to develop some interesting ambient sound palettes with what they’d pick up. The recordings could even be developed and manipulated melodically, harmonically, and/or rhythmically into something quite musical. Similar projects have been done in the past with other natural ambient recordings and a location like this would be brilliant for just such a project. Anyway, I figured you’d be the person to ask as you seem to be the leading online figure for info on these old Sound Mirrors.